Hello friends!! 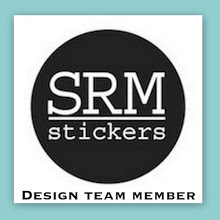 Welcome to another fabulous blog hop with the My Creative Time Design Team. If this is your first stop, head on back to Miss Emma's blog to check out what fab project she is sharing and to get all the details on the hop. Have you been following along with all the fun peeks this week?? 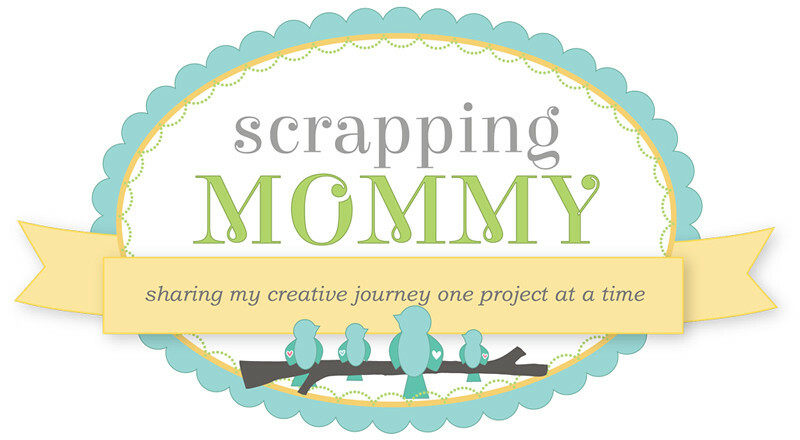 I have been totally inspired by all the wonderful projects by my fellow design team members...can't wait to scraplift some of them. ;) If you scroll down on my blog, you can see some of the other examples of projects made with the new stamps sets. 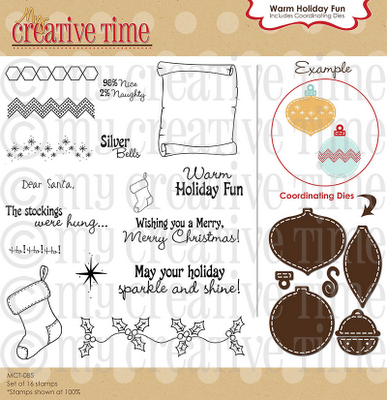 Today we get to have an awesome blog hop to check out the whole release and I have this wonderful Christmas themed project to share that features the Warm Holiday Fun set. I love to give out neighbor gifts during Christmas and I usually make tags to attach to them. This year, I am going to use these fun little tags. I cut them on my Cricut with A Quilted Christmas cartridge. They measure about 2 x 2.5 inches. I used some Christmas Red Stickles glitter glue to add some sparkle to the red cardstock that cuts separately and goes behind the white. I tied the top off with some 3/4 inch red grosgrain ribbon. I think they will be perfect to top the neighbor Christmas gifts I plan to give this yer. Next up on the blog hop is Miss Cassandra. I can't wait to see what fabby project she has created with this new release. Have fun!! Don't forget that today is the last day to enter for the fun giveaway I have going on.....CLICK HERE for the details. These cards are amazing, Amy! So pretty. Amy these tags are gorgeous! What a great idea! I might just have to 'lift' that idea when my purchases arrive, and make little tags for the gifts my children give their teachers and schoolmates. These tags are sooooo pretty! I love the way it sparkles! These are so pretty.Lucky neighbours! Great projects all week Amy. Very cute project! very creative! Wow I love it, thanks for sharing. Beautiful tags! The sparkle is so pretty and love the texture of the ribbon. Awesome mini cards Amy!!! What a super new release!! Thanks for sharing all your amazing talent all week and for the all great project ideas! So excited to get this new set!!! super simple and yet so beautiful! Love them. Love the red bow!! this is so pretty! I just got that cart too! great job! I have enjoyed everything I have seen all week! you guys are amazing! thanks!! love what you did with the stickles!! great little cards!! very classy!! Amy ~ these are so ELEGANT looking! The sentiment is just PERFECT with them becasue they soooo sparkle and shine! Just another BEAUTIFUL project! Your neighbors will just cherish these! Love the tag. I can't to try these techniques. Your tags are beautiful! The sentiment is perfect of course and love to see them used with the Cricut. Very creative idea with the stickles, love it and so elegant. Very very pretty love the cards. Wow it's August and we've got Christmas cards going.. I love this little idea. GREAT job. The tags are beautiful!! The red glitter adds the perfect amount of sparkle! These are beautiful, Amy! I love the red and white, and the sparkle is so pretty! Love the red! So vibrant! Beautiful tags! I love the extra sparkle that you gave them to match the sentiment. These will be perfect on top of presents! So pretty! Great projects all week by you all thanks for sharing. Very nice!!! I am starting to get excited about my Christmas crafts. Great cards. Love the sentiment, the colors and the shine. The stickles behind is perfect as are your bows. Great job on your cards...they are so pretty and festive! Fabulous tags! Beautiful! Love the touch of glitter! Oh, these mini cards are brilliant. Love the glitter peeking through. Love the sparkly gift toppers you created. 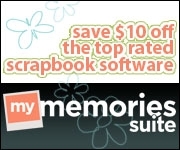 Can't wait to see all the lovely things created with this new release! Beautiful tags and fun release. Gorgeous tags, love the cut of them! Wow, those tags are gorgeous! Great job. 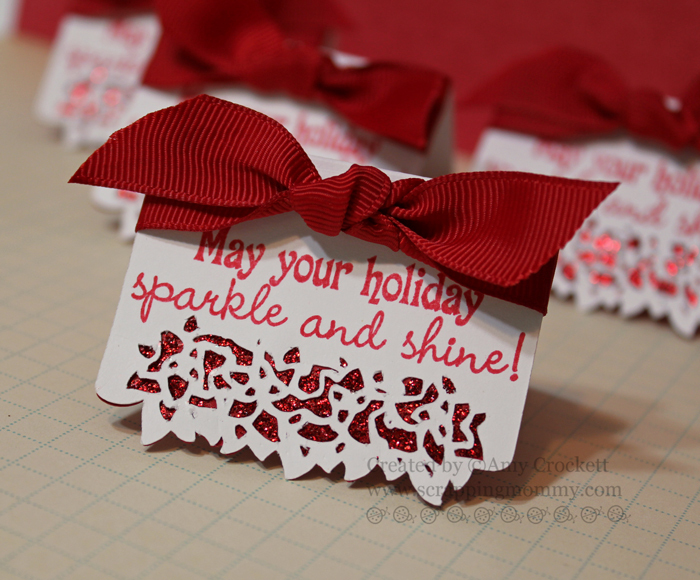 Very pretty tags--I like all the sparkle. Amy your tags are beautiful!!! You are so talented girl and I am so loving this release. Amy these are so beautiful!! Love them and the vibrant colors! WOW!! Great job! You did fantastic!! Hi Amy!!!WOW! !Very beautiful! !awesome Job!Love it! Awesome gift tags! I am sure your neighbors will love them. Great use of Emma's awesome stamps as always. Love your Christmas gift tags...I've already ordered the new release set you used..it's super cute!! Wow Amy those tags are gorgeous. TFS. Beautiful tags.The sentiment is perfect and I love the stickles. Love all the glitter - these tags are beautiful! TFS! These tags are really nice. I need to take a closer look at A Quilted Christmas cartridge. I can hardly wait to get this new collection. Thanks for sharing. Very elegant love the withe and red combo, TFS Amy! Love the mini cards. This is one of the releases I ordered, unfortunely it was out of stock by the time I placed my order but I it will be worth the wait. 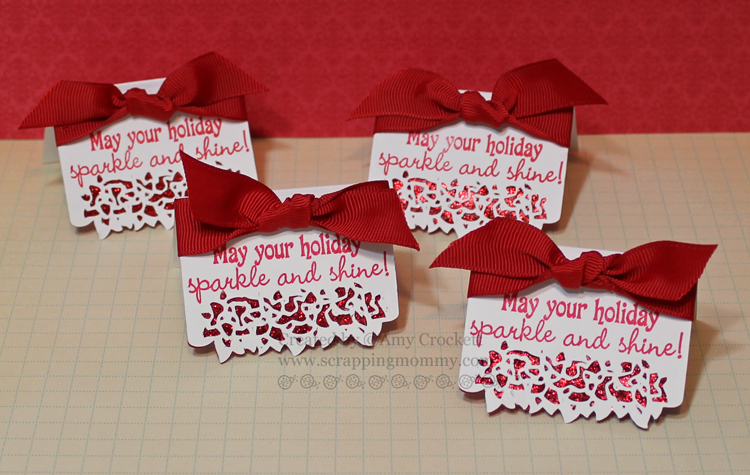 What cute tags-they are perfect for that sentiment! Very pretty tags! The sentiment is perfect for it. TFS! Amy, these are absolutely adorable, thanks for sharing! Very pretty. WOw...I can't believe it's that time of year already. Very pretty tags! Absolutely love them! Amy, I am really liking the Sparkling of the mini cards and the Sentiment. Perfect Match! Great Color Combo and Great Work! Love your little mini cards! Thanks so much for sharing. Would love to win some stamps. So cute!!! And perfect to attach to gifts for neighbors and friends! Adorable little tags! These would be perfect for mass production. These mini cards are adorable! I could attach them to gifts for my friends! Thanks for sharing. Way cute tags. I like doing the same thing for neighbors on the cookie trays I hand out. Great tags with just the right sparkle to them. Very sparkly and pretty! What a nice idea for your neighbors! Such cute tags--love the new stamps! Such lovely cars. The florished design and ribbon is great. OMG! THESE ARE AWESOME!!! EXCELLENT JOB my swee friend! Great project! Love the red sparkle. Can I be your neighbor??? Wow these are just the cutest tags. Just love the sparkle and ribbon. Great job! amy, these are beautiful! and just think you are soo ahead of the game! Love the treat toppers, great job incorporating Stickles to play off the sentiment. Super cute mini card. Great idea with the stickles. Thanks for share with us! I Love the Mini Cards, TFS! Wow...so pretty. Love these new stamps, thanks for sharing. Great job on the stickles! These are so pretty! These are so pretty! Love the sparkle. I love the tags. Red just looks so nice. Great job. Very pretty and festive. The sentiment works great with it.